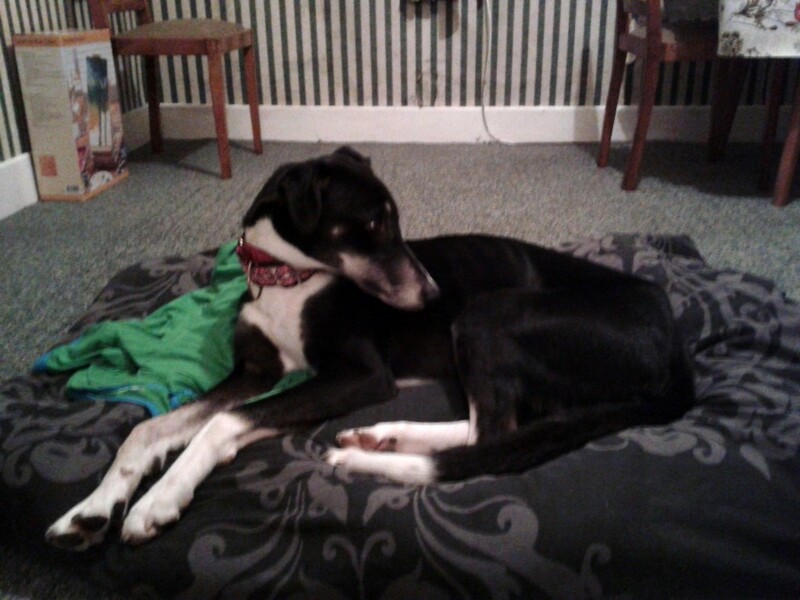 HUG was contacted by a couple in Galway City who had found a very nervous greyhound cross straying near their home, and had brought him in, but were unable to keep him long term. Since I’m Western rep for HUG, and I was already going into Galway on the weekend for a Sighthound Stroll, I picked him up to foster. 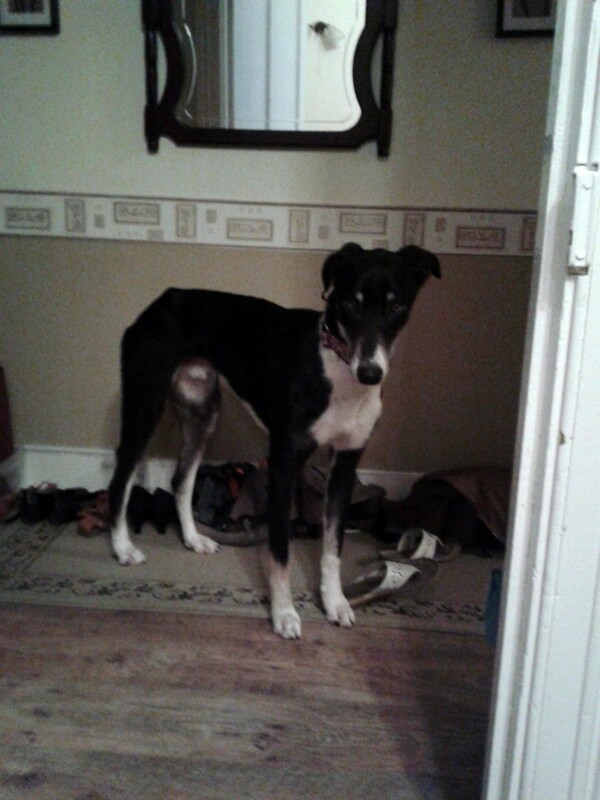 He is a striking boy, quite tall and still very thin so must have been straying for some time. 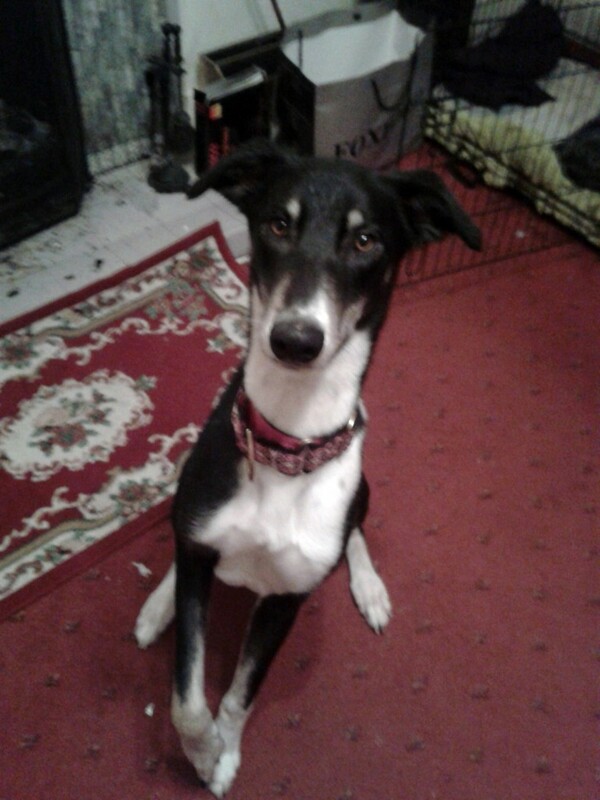 He appears to be a collie cross with possibly a bit of saluki as well, with a little curl to his tail. He must have had some very scary experiences out on the street, as he is quite fearful around strangers, and fear aggressive towards other dogs, so it has been challenging to say the least! Initially he was very good with Penny, just watching her and letting her approach him without any reaction, but the collie part of his genetic makeup is very strong, and he became a bit fixated with her, doing the “sheep stare” and following her around, so they are separated in different rooms for the time being. He’s much more relaxed when he doesn’t feel the need to be on “cat duty”! He’s had a very rough start in life, and is really only a young ‘un, so he deserves a very special home where he can have the chance to gain more confidence and be a happy dog. We’re trying to find a good quiet home for him without any other dogs or cats, but it will have to be with someone who appreciates his history and is willing to be patient working through his issues. What a beauty…. How wonderful of you to help this guy, after his rough start in life! !